I was reading an article on my local news today and saw this graphic, apparently made for the article. Being from Alabama, and just a pattern-recognition machine in general, I immediately noticed it was an anomaly. The lightest pink surrounded on all sides by the darkest red? Unlikely. 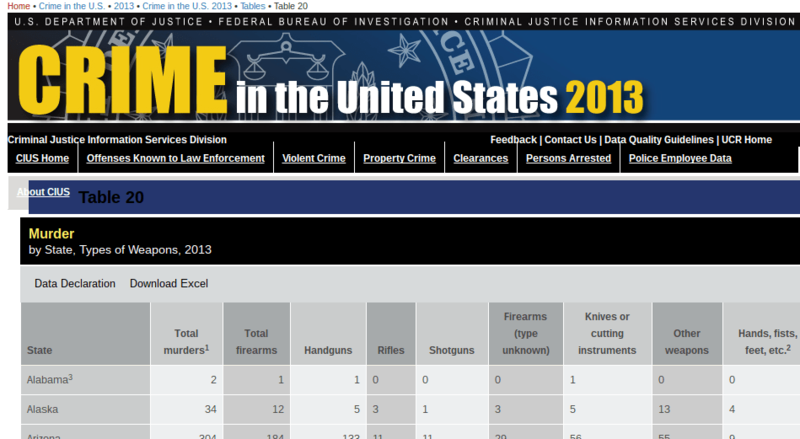 The writer helpfully provided a source though, from the FBI, so I could look at the data myself. There, right at the start, is a footnote for Alabama. It says “3 Limited supplemental homicide data were received.” Illinois is the only other state with a footnote, but because it’s not so different from its neighbors, it didn’t stand out enough for me to notice. Florida was not contained in the FBI table and thus is grey – a good choice to show there were no data for that state. But as for Alabama and Illinois, it’s misleading to include known bad data in a graph that has no explanations. They should also be grey, rather than imply the limited information is the truth. I looked up similar data from other sources to check how misleading the graphic was. Because wouldn’t it be nice if my home state had figured out some magic formula for preventing firearm deaths? Unfortunately, The Centers for Disease Control (CDC) statistics on gun deaths put Alabama in the top 4 for the most gun deaths. That’s quite the opposite of the optimism-inducing light pink in the first graphic. The graph below is for 2014 while the first graphic is for 2013, but in case you might be thinking there was some change, I also looked up 2012 (the CDC appears to publish data every two years). 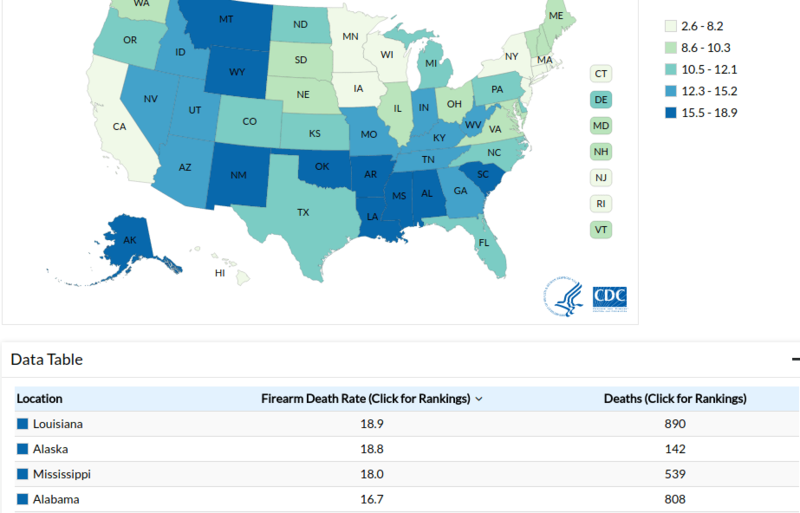 The CDC put firearm deaths per person in Alabama even higher that year than in 2014. In closing, I don’t think this graphic was intentionally misleading. Sure, there are plenty of examples where I would be happy to accuse malice instead of bad design. Most times it’s probably just people working under a deadline or with software tools that don’t allow custom corrections. 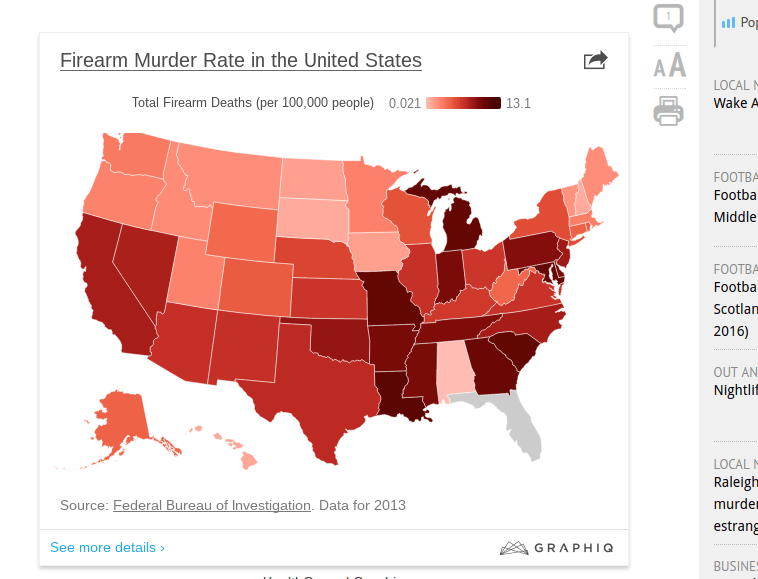 We do have to be careful – I’d hate to see Alabama not receive aid to curb their firearm death rate based on poor information visualizations. I became interested in using “big data” for A/B testing after a speaker from RedHat gave a talk to our area about it a couple of years ago. It’s a tantalizing idea: come up with a change, send it out on some small percent of your users, and pull it back immediately if it doesn’t work or isn’t better than the original. Even more amazing when you consider a “small percent” can be thousands and thousands of people – a dream for any researcher. Certainly, this connects to last year’s news on the controversy over Facebook’s A/B testing adventures. The only con I can think of is that if something works or doesn’t work, you may not know why. We are always fumbling toward success, but maybe it’s not good to encourage fumbling over development of theory. NPR’s Planet Money did a great show recently on A/B testing their podcast and the surprising results. They were also willing to think further about how it could be taken to an extreme, audience testing every segment of the show. Certainly worth a listen. The Human Factors and Ergonomics Society has a lively discussion board hosted at LinkedIn. If you like talking about issues with other professionals, have questions or need resources, or just want to see “what do these people like to talk about?” then I suggest a visit! What are the top three classical or seminal papers in HFE that you think every graduate should know? What is a safe number of characters to read on a screen while driving? What is the best statistical method for comparing Modified Cooper Harper ratings for two different designs? Does visual appeal, i.e., aesthetics, enhance usability? What is the best place to place OK button on the computer form? Trends in Function Allocation among cognitive agents (human & machine) – a new era for joint cognitive systems? Just a short note about two new HF-oriented blogs. First, Arathi Sethumadhavan Ph.D. has started a new blog. Arathi Sethumadhavan is a Human Factors Scientist at Medtronic’s Cardiac Rhythm and Disease Management. She received her PhD in Experimental Psychology (Human Factors) from Texas Tech University. Second, Ergonomics in Design, a publication of the Human Factors and Ergonomics Society, has started a blog as well. Check ’em out! Peter Pirolli (currently a Research Fellow at Xerox/PARC) will be presenting on Information Foraging Theory. See below for an abstract of his upcoming talk. Information Foraging Theory is a theory of human-information interaction that aims to explain and predict how people will best shape themselves to their information environments, and how information environments can best be shaped to people. 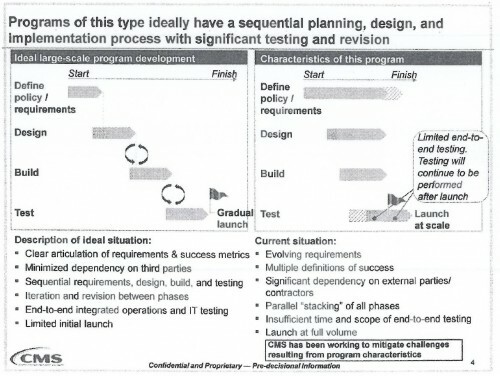 The approach involves a kind of reverse engineering in which the analyst asks (a) what is the nature of the task and information environments, (b) why is a given system a good solution to the problem, and (c) how is that “ideal” solution realized (approximated) by mechanism. Typically, the key steps in developing a model of information foraging involve: (a) a rational analysis of the task and information environment (often drawing on optimal foraging theory from biology) and (b) a computational production system model of the cognitive structure of task. I will briefly review work on individual information seeking, and then focus on how this work is being expanded to studies of information production and sense-making in technology-mediated social systems such as wikis, social tagging, social network sites, and twitter. In recent years, we have been extending our studies to deal with social interactions on the Web (e.g., wikis, tagging systems, twitter). This has lead to studies of how people assess source credibility (expertise, trustworthiness, bias ) and how user interfaces might affect such judgments. The Chronicle of Higher Education has posted a great “interactive graphic” about Bethel’s re-design of their admissions page. It includes their metrics of success, an important but often difficult to quantify validation of usability. Hopefully such attention to usable university sites will become more common and this cartoon will no longer be funny. Some humor for 2011: a “Things people have never said about a restaurant” website. A quick search turned up a few more rants about restaurant sites. Looks like an epidemic! Why ARE restaurant sites so bad? Perhaps I’m still unhappy about spending an hour looking for a place to eat in Little Rock last weekend. Flash websites and PDF menus on a 2007 Sprint Treo is not for the faint of heart.